Here is a little about interview we did with Shelby Johnson, the creative mind behind Bonfireheart.co. 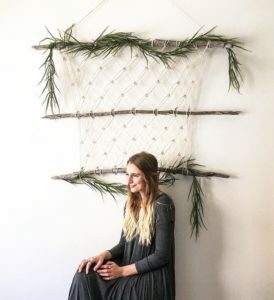 My name is Shelby Johnson and I am a 24-year-old macramé artist and college student living in Utah County. I’ve always enjoyed creating things with my hands. 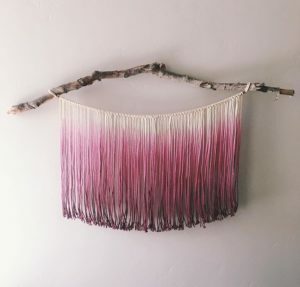 I’ve been a longtime lover of DIY projects and that’s how I stumbled upon macramé. Aside from creating art, I love to be outdoors. Being among the mountains and exploring their beauty is therapeutic for me. It centers my soul and brings me peace. I hope to use my education to teach others how personal experiences in the outdoors and with artistic creativity are therapeutically beneficial. The simple things in life that cause me to pause and take in the moment. The moments that block out the noise and bring peace to my soul: rainy drives up Provo Canyon, the smell of forest soil, the sound of Provo River along the trail, candles that smell like Christmas, warm and fuzzy blankets on a cold day, fresh bouquets of flowers (that I regularly buy for myself), and watching the sun set from Squaw Peak. When I take time to enjoy the small, beautiful things around me, it helps the stress fade away and the creativity to flow. What events have your items been used for? Living in Utah among so many other creative entrepreneurs has given me the opportunity to be a part of some fun events. My favorite event has been with local wedding dress designer Chantel Lauren. Being a vendor in her pop up shop was SO much fun. I also had the opportunity this year to set up a pop up workshop in the Free People store at City Creek Center to bring awareness for the charity Girls Inc., in support of young creative women entrepreneurs. Other events this year that I have been so lucky to be a part of are bridal magazine shoots styled by Michelle Leo Events for magazines Rocky Mountain Bridal and Salt Lake/Park City B&G Magazine. 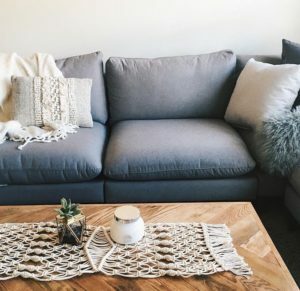 What’s your most favorite thing you have ever created? 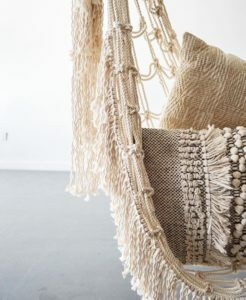 Hands down, the macramé hammock chair. I got a call from Michelle Leo asking if I would like to make a piece for a bridal photoshoot that was 6 days away. When Michelle calls, you just say yes no matter the task. It’s not every day that you get to work with the ultimate Wizard of Weddings. 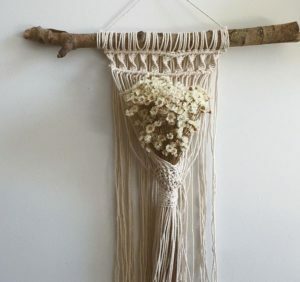 She came up with the amazing idea of the macramé chair. I had no idea what I was doing the entire time I was making it, to be honest, and I didn’t think I could make it in time. But, I am so happy that Michelle inspired me to try something new and that she believed I could create her vision. There were no guidelines online on how to make a hammock chair. Trust me, I asked Pinterest and for once they didn’t have the answer! But, somehow, it turned out beyond our expectations and I am both surprised and emboldened by the result. What are your future plans for your creations? That’s a great question! It’s hard to balance between day dreaming about all the things I would like to accomplish and those things which are feasible. Every day begins with envisioning so many ideas about what I could do with my business. There seems not to be enough time to work towards them all. For a while, I felt overwhelmed by not having a specific idea of where I was going with my business. But, I now realize the unknown is okay, too. In fact, I have learned to enjoy taking each week one at a time and to follow whatever opportunities come my way. After all, exploring the unknown is what art is all about, isn’t it? 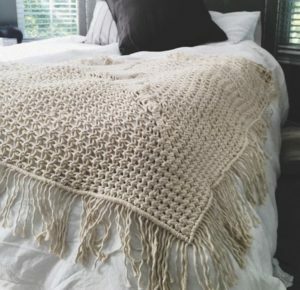 To find more information on Shelby and her craft hop onto www.bonfireheart.co or check out her instagram .